I am working on merging old blocks with current blocks (What is old blocks?). The old fashion power-ups and ‘use on me or use on oppo’ will be reserved. The current blocks (What is current blocks?) power-ups like reversed direction and BIG angry face will be reserved too. The current blocks graphic design will be reserved. The old looking will be dropped. Now, question: What other ideas do you have for blocks to make it MORE fun? Any New ideas about any thing for Blocks are wanted. Any comments, once accepted, will get 5000 coins reward in-game. Make sure you put your user id in your comment. Similar ideas will get rewarded only once, so hurry and make sure you are the first one claiming it. 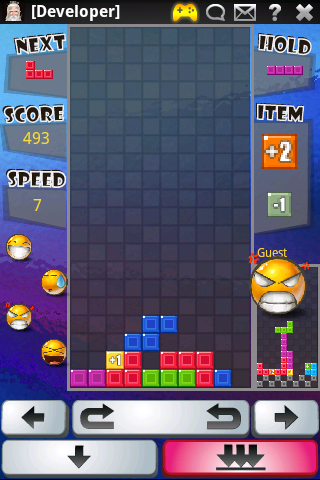 New Blocks Battle Online: Too Hard? Since the recent release of newly designed Blocks Battle Online, there have been tons of complaints crying about ‘new game sux’ and ‘it is way too hard’. Personally I think it is alright once you get used to it. The new game mechanism is faster-paced and some of the power ups can really blow up your blood pressure which makes the game quite fun and competitive in my honest opinion. But I do realize this is just a casual game most people are looking for relax rather than real fights. I will change the game mechanism soon and decrease the game difficulty. Please keep supporting Cloudroid games! Hi, cloudroid players. 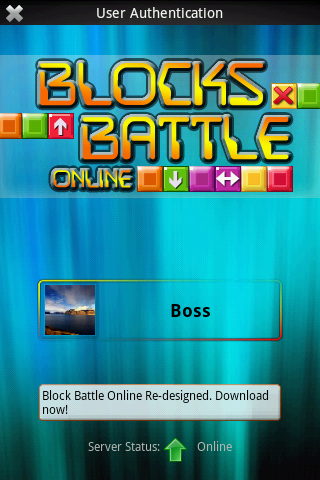 Today I want announce the newly designed Blocks Battle Online v5.0. 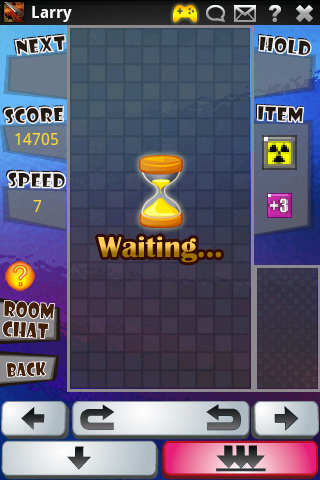 The new version comes with newly designed user interface (much prettier :P) and power-up system (much easier to use). Screen shots are on the right. I hope you like the new design and as well let me know any comments you have. As you all might already know my game is a social network gaming platform. So social features are always one of my largest focuses. I observed that in the Blocks Battle Online, during a game players usually are so busy on pressing keys and look out for attacks that they don’t have time to chat or communicate ’emotions’. Therefore I added this new emotion system try to give players some ways to express your emotions quickly and visually. In the red box on the left, there are 4 emotions for you to use anytime in the game. On the red box on the right is the visual effect that your opponent would see when you use one emotion. This can be very fun when you are going to lose and you send over an ‘OMG’ or ‘Angry’ face and greatly increase the communication between you and your opponent. There is also another game change. I created a more detailed help system to provide more information about all the items and their functions. I also hide some buttons to make the screen clearer and put them into the MENU button. Now you can click MENU button anywhere and use some of the most frequently used features. If you have comments please send me email. Thank you. 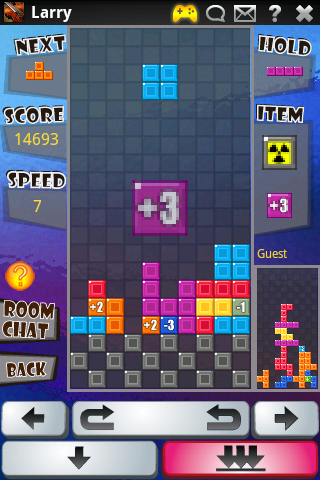 Blocks Online, a fun Tetris-like game with rich multiplayer features has just been released. 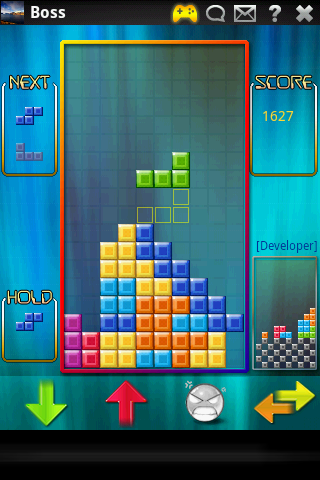 Play against Tetris players all over the world. Gain items from games and use them to attack your opponent or help yourself. Rich social features: chat rooms, in-game mail system, etc. Sign-in with your cloudroid account or simply play as guest. Go to Game Lobby and create a game room or join other player’s room to start a game. In the game you can move the falling piece with either Trackball or the On-screen keys. Trackball: Up – rotate, Left – left, Right – right, Down – down, Center – straight to bottom. On the right side of screen there is an Item section. You gain items by erasing blocks containing item pieces. The items gained are stored in the item section so you can use them. There are various items some can add more block levels to game board or increase the falling speed (bad items), while some can remove levels and even clear the whole board (good items). To use them, simply tap on the target game board (yours or opp’s). Remember: the game will not stop you from using bad items on yourself so…be careful 😛 If you need to know what does the item do, just click on the item a description will pop up. You can view the next Piece on the top-left corner. For each falling piece you can put it on hold if you find it more useful later you can click it again to use it. You can view your total score and current speed on the left bars. There are also a question mark which leads to the in-game help system, and a button goes to the in-room chatting and another button goes back to game lobby. For a more detailed game help, click ‘?’ on the top-right corner for a in-game help. 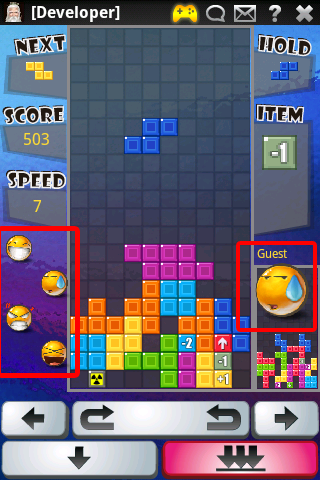 Go to android market and search for ‘blocks’ or ‘tetris’ and look for ‘Blocks Online’ from ‘Cloudroid’. This game supports 320×480, 480×800, 480×854 screens. It does NOT support 240×320 screen size due to the over-sized game board. Sorry for that.